There are many types of flooring. One of them is pallet flooring. For some people, wood pallet flooring has its own unique appeal. However for some homeowners, pallet flooring doesn’t seem to be that appealing as they are seen to be unrefined, coarse, and knotty. This is only a matter of personal preference. Speaking of wood pallet flooring, are you interested in creating your own pallet flooring? If you are, you just came to the right place. Here, we will tell you about creating wood pallet flooring on your own without spending any money. How can you do it? Well, just read on and you will know it soon. 2 Why Use Used Wood Pallet Flooring? 3 Where to Collect Used Pallets? Everything has its own pros and cons. Pallet flooring is no exception to this. There are pros and cons of using wood pallet flooring. Before you install wood pallet flooring, you may want to know what the pros and cons are so that you can make an informed decision. Alright, the following are the pros and cons of using pallet boards as flooring. Let’s start with the bad news first. Due to being used items, using wooden pallets to create wood pallet flooring brings various potential issues. For instance, the pallets found may carry bacteria like salmonella or E.coli, which can lead to health issues. Although this may not be an issue since it is flooring we are talking about, a part which is not in contact with our food, it is better to be informed about it. Used pallets may also contain fungus, especially those that are left in a moisture area for a long time. To avoid fungus from growing on the wooden pallets, you need to keep the pallets dry. The problem with fungus is that wooden pallets are hard to clean. It requires extra patience to clean them. These are two cons of using used wooden pallets as flooring. Should you avoid using wooden pallets, then? Not necessarily. Remember, everything has a risk. If you take some precaution, they should not be an issue for you, even if you decide to use used wooded pallets as flooring. Let’s move on to the pros now. What kind of pros that used wooden pallets have? Well, there are five pros of using used wooden pallets. The first and foremost reason to use these pallets is their affordability. You can get old wooden pallets with a very low price or if you know where to look, they are free. The second reason is that wooden pallets are versatile, strong and durable. With proper maintenance, they can stay for a long time. If you use wooden pallets as flooring, you would not need to worry about planning major renovations any time soon. The third reason is wooden pallets are widely available. That is, you can find used pallets just about anywhere. Why is that? As we said earlier, thousands of tons of wood pallets are disposed of each year. Not surprisingly, you can easily find them. You can find them in some stores that are selling used materials. You can also find them on dump sites. Yes, it is easy to find used wooden pallets. The fourth reason is they are repairable. Not only they are strong and durable, but they are also repairable as well. In case of your pallet flooring damaged or some of its part break, you can fix them easily. Again, you don’t have to worry about planning renovations any time soon. The last reason is that they are basically recycled. Some of the pallets you found may come from a part of a wall, for example. Instead of being thrown into the dump, you use them as your flooring. It is an environmentally-friendly way to improve your house. Why Use Used Wood Pallet Flooring? There are two main reasons why. The first reason is that it has little to no cost to utilize used pallet boards to create your own wood pallet flooring. Of course, there are processes involved before used pallet boards are installed on the floor. The second reason is that it is more environmentally-friendly. Each year, thousand tons of pallets are discarded. It is a huge waste of resources. Ironically, some of these used pallets can still be used. Where to Collect Used Pallets? Now that you decided to use used wooden pallets, where should you look for them? As previously mentioned, you can get them from various places, including stores that sell used materials or in the dump sites. If you choose to buy wooden pallets, then just do it. If you choose to find them yourself, you may need to get permission before you enter a dump site. Why? Because some dump sites are not freely accessible for everyone while some others are. If you live in an urban area, this is an easy thing to do. Warehouses, department stores, and grocery stores order items in large shipment. Often times, large wooden boxes are used in the process. When the storing process is done, these stores usually dispose of the pallet boards. You can get these pallet boards for free. All you need is to ask. Just like the stores we mentioned earlier, these places also use wooden boxes for their shipment. Unlike large stores who can dispose of these pallet boards easily, new business places, small garden stores, and small hardware stores simply don’t have the means to do so. This means that they will gladly give you those pallet boards for your flooring. These should be your last stop for searching wooden pallets. Unlike the above, wooden pallets in dump sites are more likely to carry bacteria or fungus. Not to mention if wooden pallets are dirty, it will hard to clean them up. To make your searching process more effective, we have some tips that can help you. Yes, you don’t have to wander aimlessly miles away from home. Instead of doing that, you can start the search from the nearby areas where you live. Visit local hardware stores, warehouses, department stores, and grocery stores. Who knows they have wooden pallets that you need? Keeping important contact can do wonder here. Keep the names of those who have helped you in the searching process. 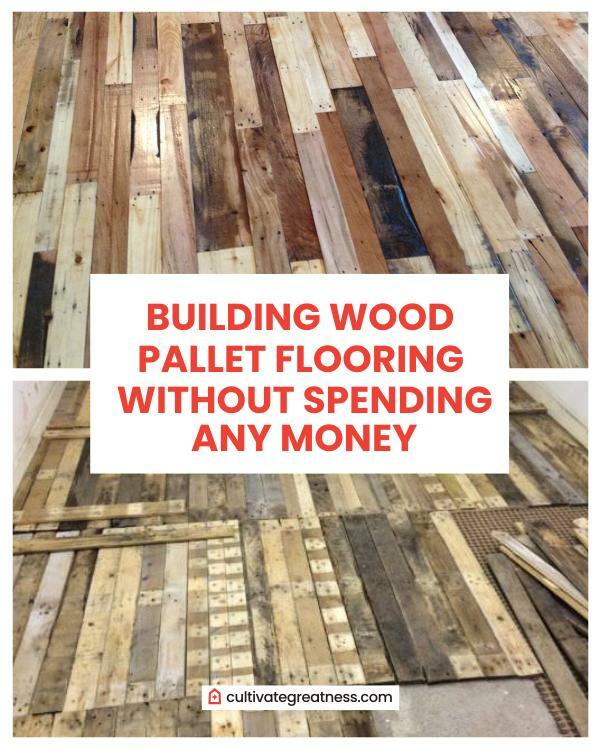 This may be your first wood pallet flooring project. Will it be the last? Don’t be so sure. As there is always a possibility that you may need some wooden pallets again, you should keep important contact. This is especially important if you purchase the pallets. Indeed. Tell people about building flooring using used wood pallets. Not only this is a great way to improve your house, but it is also a good way to keep the environment clean. After all, you are using what other people think as garbage. Also, if people see that even things that are supposed to be a garbage can be transformed into something beautiful, they may want to do the same, too. Who knows they can give you some places where you can get quality used wooden pallets in the future. Now that you find enough wood pallets, what should you do? Should you install them directly on the floor? Of course not. The first thing to do is to remove any nails that the pallets may have. While you remove nails, be sure that no metal is left on the board. Try to minimize the damage from the removal. The next thing to do is to clean the pallets. Wash the boards with water, spray disinfectant on them, and let them sundry. If there is any fungus, make sure that you remove them first before installing the boards as flooring. First thing first, you need to find the joists. You can found them spread throughout the floor. You can use a hammer and tap the floor or a stud finder. Doesn’t matter which, just find the joists first. After the joists are found, you can start laying the planks. How you lay the planks should be based on the joists’ direction in relation to the room. Next is to nail down the pallet boards. Before you nail them down, be sure that the new flooring is installed properly and has the proper angle to the joists. When you are certain that the new flooring is installed properly, you can start nailing down the pallet boards. Be sure that each of the boards is tightly together from the nailing. The final thing to do is to complete the flooring. You need to cover the ground entirely with pallet flooring. Don’t do it halfway. If, however, there is some space left unfilled, you can use a smaller piece to fill the gap.